Can only view assigned clients sub-permission explained. Staff members with Default Permissions can view the appointment schedule for all staff members, as with administrators. 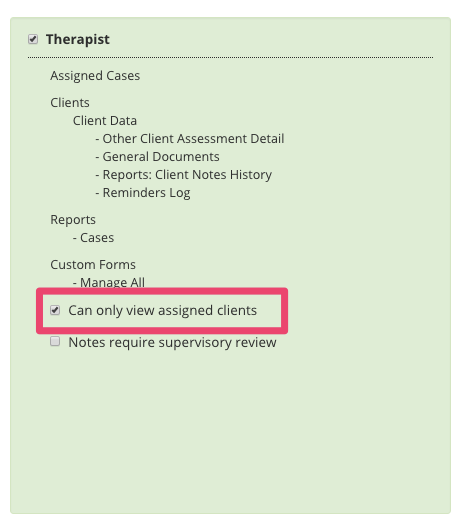 However, staff members with Therapist level permissions can be limited in what they can and cannot see in regard to their colleagues calendar based on their permissions. The box or setting that makes the difference is the sub-permission located on the Therapist permission block, "Can view only assigned clients." This staff member can only see and access the clients they are assigned to. They will not be able to see the schedule of their other colleagues. If they search for an existing client they are not assigned to nothing will show up. It will be as if the client does not exist in your TheraNest account. If this box is unmarked then the staff member can see and access all client's GENERAL information (demographics, appointment history, billing if they have billing permissions). They will be able to see the client exists in your TheraNest account and they will be able to see their colleagues schedule. They will still NOT HAVE access to clinical information if they are NOT assigned to the case. In order for a therapist to have access to cases and clinical information they must be assigned to the client AND the case. If staff members can see other staff's schedule this also means they can change/edit appointments for other staff members. There is currently not a way to block this.